We often using different storage cards of different equipment in our daily work, but experience the problem of USB port is not enough, and now the all-in-one adapter hub can provide multiple USB equipment to work at the same time, and it can simultaneously read different storage card information, greatly enhance the work efficiency. Welcome to visit LLP International Group in Amazon, thank you for your smart choice to get your desired adapter hubs from us. COMPATIBILITY: Plug it into your computers USB port, it will receive 4 card readers and 3 USB 2.0 Ports. Lightweight and portable with low power consumption, it is suitable for desktop and notebook PC. CARD READER: It can read and write on MS SD Micro SD M2 Card types, etc. Avoid the hassle of carrying multiple card reader adapters, and you can transfer photos, music, data with this hub. 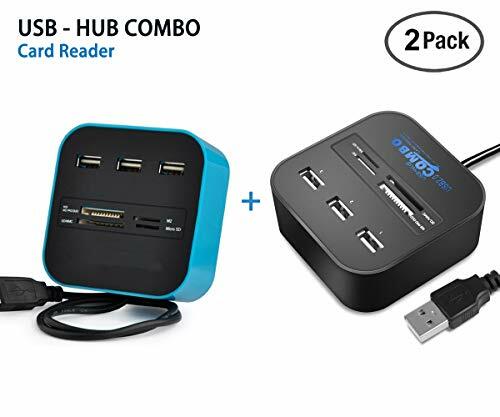 HIGH EFFICIENCY: USB Hub mixed with card reader means you can read and write on 4 different card types as you use 3 USB ports at the same time. easily to transport data from each card or connection device, and all in exchange for 1 USB port on your computer. QUALITY: The adapter hub provides premium quality, which has been proved to be the best selling hub in the past years. 12-MONTH WARRANTY: We provide 12-month warranty and one month hassle-free return policy. You can refund for any quality or satisfaction issues. If you have any questions about this product by LLP, contact us by completing and submitting the form below. If you are looking for a specif part number, please include it with your message.